After you have cooked a great meal, serving it up for all to enjoy is the icing on the cake. How you present food on the table or buffet can make your culinary creations even more memorable and appetizing. For many of us, preparing the table and serving the food is the most delightful part of dining and entertaining. We Americans love to entertain–casual style. From a sit-down meal with family from out of town to a backyard BBQ with the neighbors, we prefer casual to formal. The American casual lifestyle has evolved over the years into a style all its own, transforming how we dine and entertain. All you need is a little planning and the right serving pieces to impress guests with your own unique style of casual entertaining. For the last 30 years, ttu® has made it easier for customers to express their casual entertaining style. We design and manufacture trend-right quality serveware products infused with a unique American sense of style to fit each customer’s personal style. As casual lifestyle trends have changed over the years, so have we, always bringing you the freshest popular serveware products. Mix & Match solid colors, patterns and materials for settings that are uniquely you. 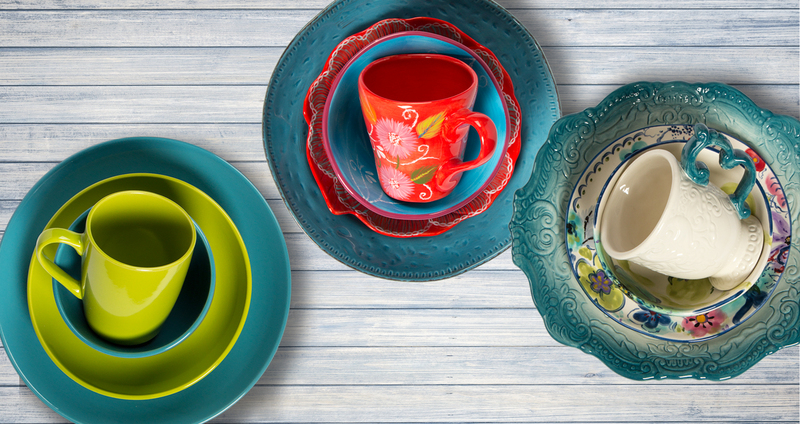 ttu is proud to be the leader in creating mix and match dinnerware programs that allow you to showcase your sense of style through mixing solid colors with solids, solid colors with patterns, and patterns with patterns. The possibilities are only limited by your imagination. We think bone china is perfectly suited for everyday dining! Today, with social attitudes changing toward entertaining to a more casual lifestyle, the lines have been blurred as to what is formal or informal. We define formal or informal from a design perspective and a convention of the table setting, as opposed to defining it based on material. Named for the addition of bone ash (minimum 25%) or the commercial equivalent for added translucence, and a chalk-white color. Originally developed by Josiah Spode the younger in 18th century England, Bone China is produced worldwide. Thin and light in weight, Bone China will resonate when struck. Easy to take care of, it is durable, chip-resistant, vitrified, microwaveable, dishwasher safe and lead-free. Elegantly casual designs are ideal for everyday use. A thicker, heavier ceramic than Fine China, Casual China is characterized by its opacity and weight. It is also easy to take care of, lightweight, durable, chip-resistant, vitrified, microwaveable, dishwasher safe and lead free. More affordable than Fine Bone China, its stylish casual designs are also perfect for everyday use. A hard, translucent clayware that differs from Bone China only in the manufacturing process. In all other regards, it is indistinguishable from Bone China. Porcelain is easy to take care of, lightweight, durable, chip-resistant, vitrified, microwaveable, dishwasher safe and lead-free. Tasteful casual designs and patterns are ideal for daily use. Halfway between China and Earthenware, Semi-Porcelain is an American development. Fired at much higher temperatures than Earthenware, Semi-Porcelain dinnerware has some of the durability of China, but comes at a much lower cost. It is made of light-colored clay and fired at high temperatures. Stoneware is opaque and heavier than china but will still resonate when struck. It is available with decals or in hand painted versions. This hard, durable ceramic heavyweight is often ovenproof, microwaveable, dishwasher safe, chip-resistant, and sometimes thermal shock resistant. Made from a mix of clays and other materials. When fired at temperatures higher than pottery, the color of the bisque changes to a whiter color. Stronger than terra cotta, Earthenware comes in a wide range of colors. It is characterized by its artisan look and feel, and is usually used for hand painted and handcrafted serveware. Vibrant colors and visible brush stroke marks are among unique welcomed characteristics of Earthenware. It is dishwasher safe and microwaveable (will get hot to the touch). Earthenware is an artisan piece and requires a bit more care than other materials. Made of a composite of fire-resistant resins and paper pulp, this dinnerware was a favorite of the fifties. Today, Melamine is the choice material for entertaining around the pool, at picnics, outdoor parties and everyday dining. Virtually indestructible, dishwasher safe and easy to take care of, Melamine can be manufactured in many colors or printed with intricate decals. A fun, carefree serveware. Steel dinnerware and serveware with a vitrified enamel surface. Similar in composition to enameled cookware, Enamel Dinnerware is lightweight, very durable (will not break when you drop it), and does not absorb odors or stains. Dishwasher safe. All ttu® serveware meets or exceeds FDA and California Prop 65 regulations. For additional info, please see FAQ. x 1.5 = number of servings to buy. A family of four needs 4 place settings, plus one and a half place settings each for entertaining. The additional place settings should accommodate just about every social setting. Using this formula for a family of four, you will need to buy 10 place settings. For a family of six, 15 place settings should be enough. Whether it’s a family meal or a fancy dinner party, serving pieces are essential. Typically, you will need one serving piece for every 3 to 4 people at the table. Relax…Bodies serve specific tasks but don’t get hung up on it. Use bodies to serve your need. The following is a brief guide on how to differentiate the various bodies and describe their roles at the dinner table. Charger: A large diameter (13″ to 15″) “under” plate on which the service plate is placed. The charger is used during the first courses of the meal and is removed from the table when the entrée is served. Serving Platter: A long serving dish, typically 14″ to 21″ in diameter, round or oval in shape, the serving platter is used to serve everything from appetizers to a whole turkey. Dinner Plate: Typically 10.75″ to 11.5″ in diameter, the dinner plate is used for dinner/supper service where the menu requires a larger plate. Luncheon Plate: Typically 9.5″ to 10.5″ in diameter, the luncheon plate is sized for smaller, simpler menus. Salad Plate: Typically 7.5″ to 8.5″ in diameter, the salad plate can also be used to serve sandwiches. Dessert Plate: Typically 6.5″ to 7.5″ in diameter, the dessert plate is used to serve dessert. Bread & Butter Plate: Typically 6″ to 7″ in diameter, used to service bread or rolls. Canapés: Typically 5″ to 6″ in diameter, the canapé is used for hors d’oeuvres. Soup Plate: A shallow dish typically 7″ to 8″ in diameter, used to serve soup. Pasta Bowl: Typically 7.5″ to 9″ in diameter, the pasta bowl is somewhat deeper than a soup plate but shallower than a cereal bowl. Cereal Bowl: A deep bowl typically 5.5″ to 6.5″ in diameter, the cereal bowl is distinguished from other bowls by its depth. Mug: A large, cylindrical handled cup with a capacity of 12 ounces or more. Cup & Saucer: The cup is larger than a demitasse with a capacity of 8 to 10 ounces. A saucer, with a diameter ranging from 4.5″ to 5″ accompanies the cup.